DRI sweeps the eGovernment Awards! The Digital Repository of Ireland won three Ireland eGovernment awards yesterday for Inspiring Ireland, the ambitious project it spearheaded in collaboration with eight of Ireland’s National Cultural Institutions, and the Department of Arts, Heritage, and the Gaeltacht. DRI won the event’s Overall Award, which includes the finalists from all projects and organisations shortlisted for an award in 2014. 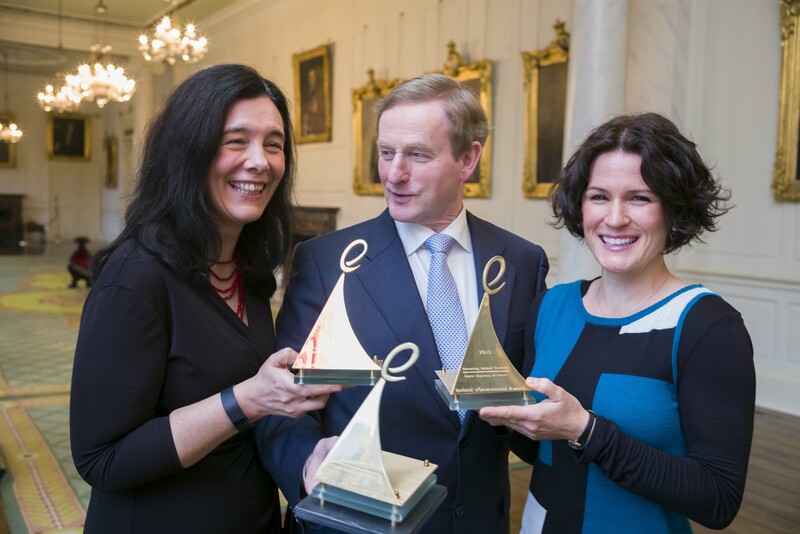 The awards were presented on January 29th by An Taoiseach Enda Kenny during a gala event at Dublin Castle. Set up in 2001 to recognise excellence and innovation by public sector bodies who are pioneering change in the delivery of eGovernment services in Ireland, the awards are sponsored by eircom Business Solutions and jointly run by the Public Sector Times and digital marketing company Elucidate. “Inspiring Ireland from the Digital Repository of Ireland is a really innovative and really important solution to a problem: we have a wealth of cultural heritage in Ireland. This project was about making that information – that richness of cultural heritage – available to the country and to Irish citizen abroad. But not only Irish citizens – equally people who have an interest in Ireland” commented awards judge Paddy Hopkins (former Company Secretary at Enterprise Ireland). Ireland eGovernment Awards 2014 - Overall Winner video intro from Digital Repository of Ireland on Vimeo. Ireland eGovernment Awards 2014 - Promoting Ireland Overseas video intro from Digital Repository of Ireland on Vimeo. Ireland eGovernment Awards 2014 - Open Source Award video intro from Digital Repository of Ireland on Vimeo. Inspiring Ireland is a centralised, curated online portal to Ireland’s cultural heritage; it’s an ambitious project to bring Ireland’s cultural treasures – paintings, letters, sculpture, manuscripts, historical objects, music, photography – both digital and digitised – to a national and international audience. The first of its kind in Ireland, the website offers Ireland’s exceptional cultural heritage from a broad range of galleries, libraries, archives and museums to showcase Irish digital-cultural innovation globally. Inspiring Ireland is also the pilot for a systematic programme in preservation, access and discovery for digital objects in Ireland’s Cultural Institutions. The project is the result of an intense and productive collaboration between ten bodies: Digital Repository of Ireland, Department of Arts, Heritage, and the Gaeltacht, Abbey Theatre, Chester Beatty Library, Crawford Art Gallery Cork, Irish Museum of Modern Art, National Archives of Ireland, National Gallery of Ireland, National Library of Ireland, National Museum of Ireland. The Digital Repository of Ireland (DRI) is a national trusted digital repository that preserves and provides online access to Ireland’s social and cultural heritage. A consortium of six partners -- The Royal Irish Academy, TCD, NUIM, NUIG, DIT and NCAD – the team includes software engineers, digital archivists and librarians, legal, policy and requirements specialists, social scientists and humanities scholars. Funded by the Irish Government via the Programme for Research in Third Level Institutions in 2011, the DRI has won competitive funding for a number of additional research projects in the ICT, education and culture sectors, and actively collaborates with a number of partners, including RTÉ and the SFI-funded Insight Centre for Data Analytics, among others.